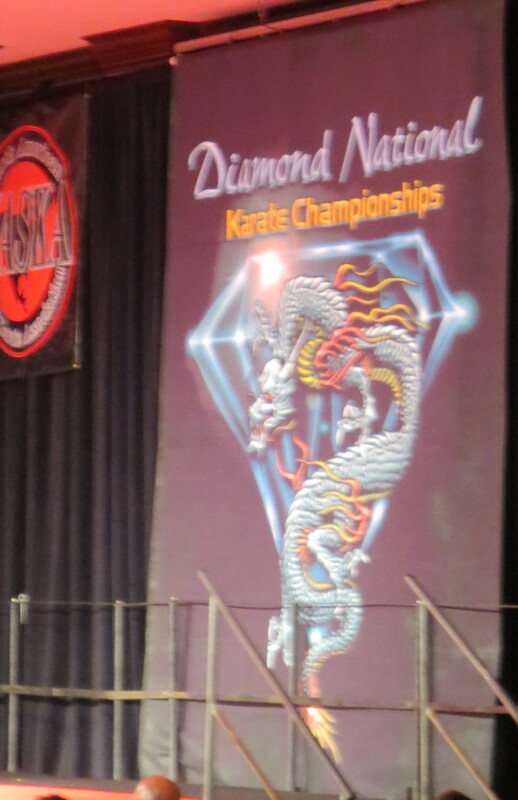 Last weekend, was Michael’s 3rd karate tournament, the Diamond Nationals. This tournament brings the best of the best from all over the country (and Canada) to compete. 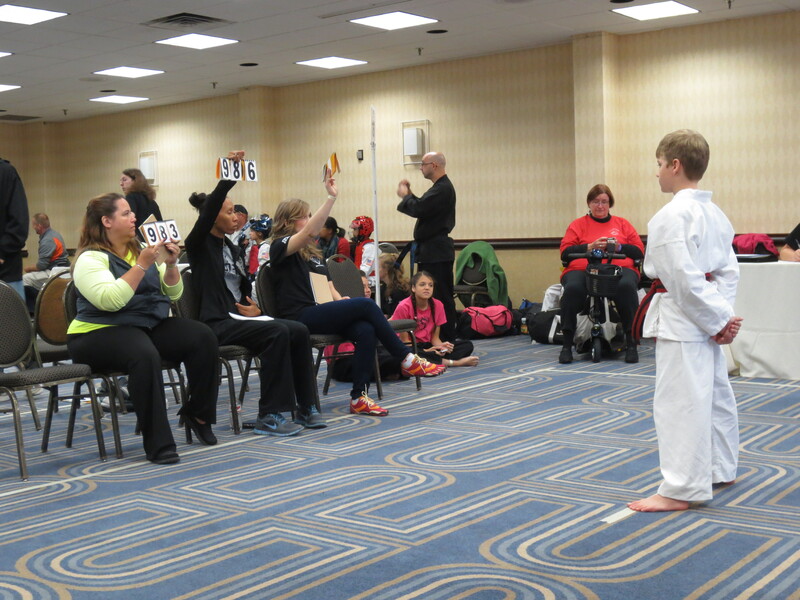 The black belts who make it into the “night show” are competing for a $10K diamond ring. WOW! I remember back when I took Kung Fu, watching my friends compete in the Diamonds (as we called it). I always looked forward to this tournament, because it brought out the best competitors. The black belts are AMAZING to watch! My favorite are the Musical Forms, Creative Forms, and Creative Weapons Forms. The gymnastics they can do are nothing short of spectacular! Michael doing his form, Hadong. Michael receiving his scores for form. There were so many boys in his age category, 8-9 year old red belts, that they had to split them into two rings. They tried to make sure boys from the same dojo weren’t competing against each other. There were about 8 boys in Michael’s final group for forms. Michael’s name was drawn to go first. I’m never sure if this is a good thing, or a bad thing. He did a great job, but was still very nervous. He rushed a bit, but hit his power moves hard, and yelled nice and loud. There was some very good competition he was up against. Once the other competitors went, it was time for judging. Michael’s scores were 9.83, 9.86, and either 9.85 or 9.87. Awesome scores; we thought he was in 4th place by the end of judging. Unfortunately, he ended up as a Finalist, 5th place. He was the last finalist called before 4th. It must have been VERY close between those two positions. While he would have loved to take home a trophy, he now has a plaque to put on the wall by his belts. After form, it was time for sparring. It looked like the number of boys sparring, was triple those competing in form. They wrapped around 2 sides of the ring. Again, they split them into two rings. Michael’s ring had an uneven number of competitors in it. He ended up being picked for a bye for the first round. The boy he sparred first won his first match, and had repeated reminders that head contact was to be light. That would psych anyone out a bit. Michael went in there, and put up a good fight. He didn’t win, but he didn’t just let the other kid take the win either. The first boy he lost to, won the entire division, so we couldn’t feel too bad about Michael’s loss against him. Since he lost his first match, he was put in the Consolation Bracket. He won his first match. It was very impressive! He’s very good at kicks, and using them helps him rack up the points. 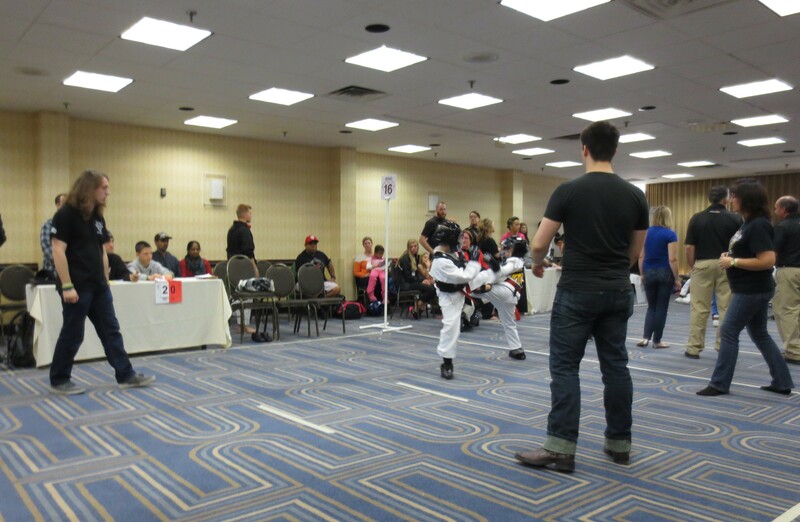 His 3rd sparring match was for Consolation (4th place). It was a very close match, and was tied when they called time. The next point would win the Consolation trophy. Both boys were determined not to lose. They both kicked (and landed) at the same time. It really could have been anyone’s point. Unfortunately, 2 out of 3 judges’ opinions count. It was 2 judges for the other boy, one for Michael. The call was mistaken, not because it went for the other boy, but because one said 2 points for the other boy, one said 1 point. It was called as two points. Oh well. 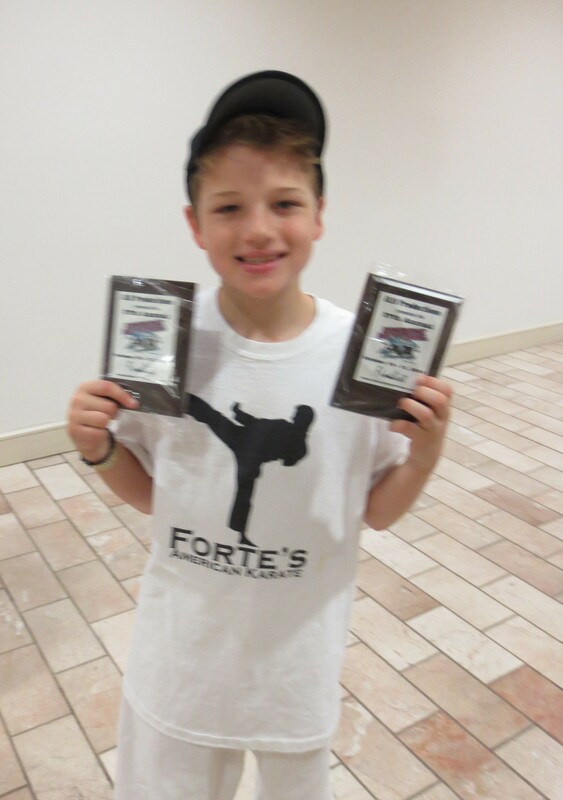 Michael took 5th place, and received a Finalist’s plaque. That makes 2 plaques for the wall. Michael and his Finalist plaques. After Michael competed, we went to lunch with his aunt and cousin. Then we went back to hang out at the hotel until it was time for the night show. 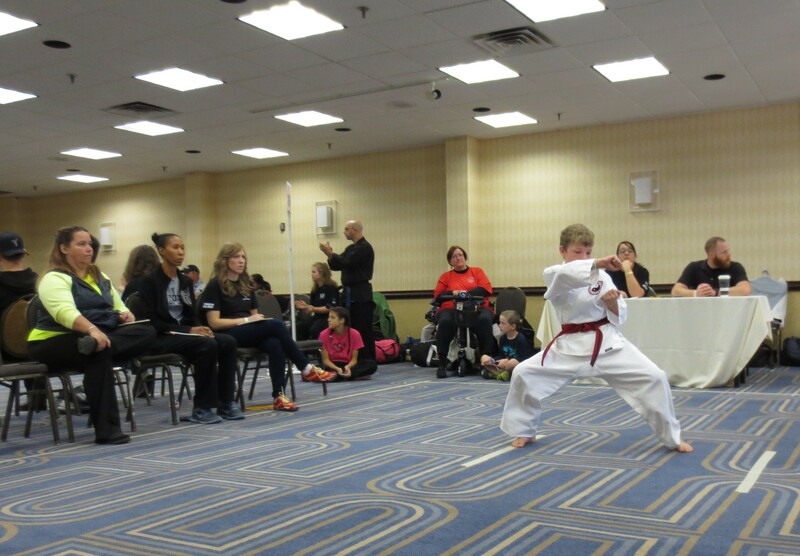 Grace and I watched some amazing black belts compete for their place in the night show. Wow! We also watched Michael’s karate teacher, Mr. Hallberg, spar in hopes to make it to the night show. This was not his year, but it was fun to watch them spar! During our hours of hanging out, Michael asked some random boy walking by if he wanted to spar. For the next 2+ hours, Michael and this boy, Kyle, sparred (with no pads, of course), and hung out. They really seemed to enjoy themselves! 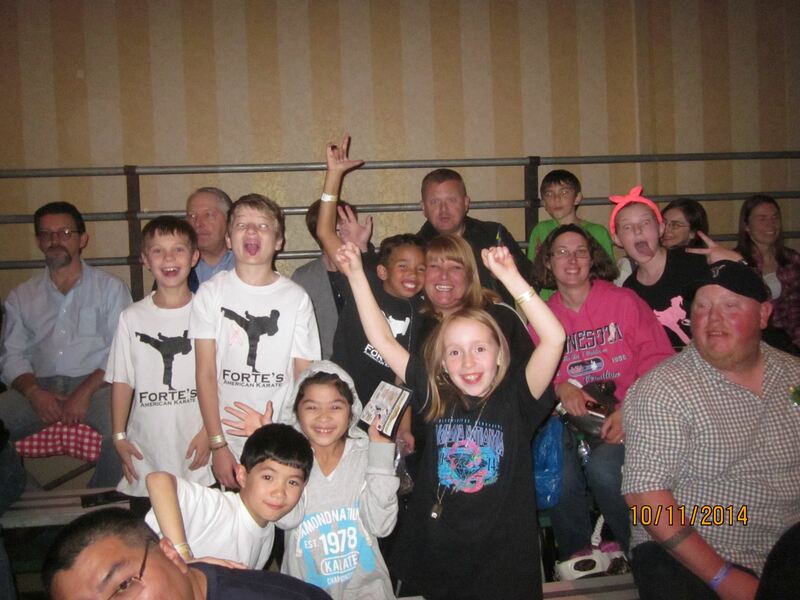 When it was time to line up for our seats for the night show, the adults stood in line… Michael, Kyle, a few other kids from Forte’s American Karate, and some other random karate kids were all hanging out. All the sudden, a group of them, ranging from ages 6 to about 11 or 12, sat in a circle. We wondered what they were doing, until one got up and started going around the circle saying, “Duck… Duck….” Apparently, even tough kids can play Duck, Duck, Gray Duck! That’s what we call it in MN. Don’t even get me started on the Duck, Duck, Goose controversy. The night show was amazing, and made it well worth the $35 we paid to be spectators for the day. It was a pretty steep price though, for those who only came to watch during the day. They really should have had a reduced price spectator fee for those (such as Michael’s aunt and cousin) who only came to watch the competitors during the day. Yes, those ARE my two kids sticking their tongues out… Sheesh. Master Forte and his wife were sitting just outside the scope of this picture. Besides the amazing forms, weapons, and sparring we saw that night, the coolest part, was that most of Team Spartan (the White Bear portion of Team Forte), sat together. Master Forte, and his wife Laura sat with us too. I enjoyed watching him having as much fun as the rest of the group. There was a great comeraderie that night between kids, parents, and Master Forte. I think all the kids were inspired to continue to get better at karate. They were even talking about wanting to do a “Team Form”, where they all do their form in unison. That would be so cool! I think some of them were also inspired to take more gymnastics so they could do amazing creative forms too! I’m excited to see what the next year holds for Team Spartan, and Team Forte as a whole!